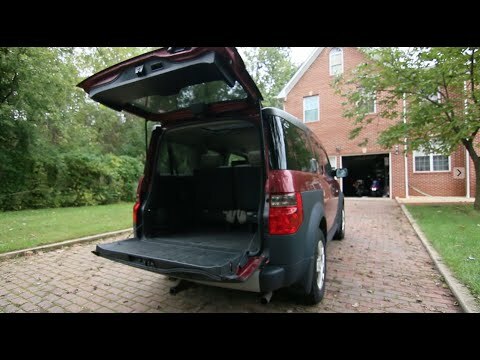 If you love traveling the great outdoors and need a smart, affordable vehicle to transport you and your many pieces of gear without hassle, the 2008 Honda Element will work for you. Honda element, my go to transport! I have been totally happy with my Honda element. It has served me well and I am now over 175, 000 miles. The key, I found, was to have regular maintenance checks, etc. Honda is an excellent car manufacturer. I purchased the element because I am an artist and have to convey art displays from place to place. I do not do that as much now, but I also have two dogs who inhabit the back when I go on trips or errands. I have never used the back seats. My personal opinion is that they are not needed. After 10 years, I have never used them. I was living in the mountains when I purchased the car, so that is why I like the four wheel drive. However, now that I live at the beach, it is not necessary. I have used this car like a workhorse and thankfully have not had major problems. I highly recommend it! Very easy to maintain inside and out, no carpet, all rubber mat. It has been a very dependable and safe car. It drives well and gets great gas mileage. It is all wheel drive so you are required to replace at least 2 tires and preferably all four so if you get a nail in one it is a bit pricey but well worth the all wheel drive functionality. It is very roomy and the rear seats fold up to the sides if you need to haul anything. Also it is completely rubber mats no carpet on the inside, so easy to clean. The rear seats are a little high so if you are over 6' your head does touch the ceiling but in the front it is very comfortable and bucket seating. Honda element, bring it back. We love our Honda element it has lasted longer than any other car we have owned and it gets great gas mileage. We love that it has no carpet but is completely lined with a one piece rubber mat. It has a huge sunroof and the rear seats lay flat and you can look up and see the sky. The rear seats also fold up to the sides so you can haul things in the back for any project. It still looks new and we get compliments on it all the time. The biggest complaint I have is that they stopped making them, they need to bring them back. ALL IN ONE MOBILITY WILL NOTIFY OWNERS AND THE VEHICLES WILL BE REPAIRED FREE OF CHARGE. THE SAFETY RECALL IS EXPECTED TO BEGIN DURING JUNE OR JULY 2010. OWNERS MAY CONTACT ALL IN ONE MOBILITY AT 1-503-255-5005. HONDA IS RECALLING 241 MY 2008 ELEMENT VEHICLES. THE FRONT BUSHING BRACKET OF THE LEFT TRAILING ARM OF THE REAR SUSPENSION MAY HAVE BEEN IMPROPERLY WELDED AND COULD SEPARATE FROM THE TRAILING ARM. A SEPARATED BUSHING BRACKET COULD CAUSE THE SUSPENSION TO RELEASE THE LOWER PORTION OF THE WHEEL HUB, CAUSING A LOSS OF CONTROL AND DAMAGE TO THE BRAKE SYSTEM WHICH COULD LEAD TO A CRASH. OWNERS WILL BE CONTACTED BY PHONE AND ADVISED TO STOP DRIVING THEIR VEHICLES UNTIL THEY HAVE TAKEN THEIR VEHICLE TO A DEALER FOR INSPECTION. DEALERS WILL INSPECT THE LEFT REAR TRAILING ARM AND, IF NECESSARY, REPLACE IT FREE OF CHARGE. THE RECALL IS EXPECTED TO BEGIN DURING JULY 2008. OWNERS MAY CONTACT HONDA AT 1-800-999-1009.